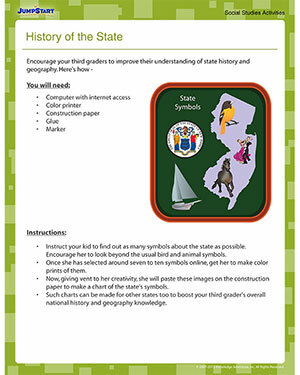 Here is a chance for your 3rd grader to know more about their state's history as well as geography. JumpStart's 'History of the State' is a fun online state history worksheet for third grade that encourages the kids in this grade to improve their understanding of the state's history and geography by looking beyond the usual bird and animal symbols. A must-have this year! Don't forget to check out the other online social studies worksheets too!